The first thing that struck me was that many of the topics being presented on were very familiar. Libraries (especially academic libraries) are still grappling with iterative user-centered design, managing data, and how to demonstrate their value while still protecting patron privacy. Newer, though, was an emphasis on management methods and how solutions to some perennial library problems require social as well as technical engineering. This was a major theme of the keynote by Casey Fiesler of the University of Colorado Boulder. Prof. Fiesler, who talked about how algorithm-driven news feeds and copyright filters on platforms such as YouTube can lead to a proliferation of fake news and frivolous take-downs of fair use content. Much of the response to these trends has been to pressure tech companies to improve their algorithms. But really, Fiesler argued, the solution can not be wholly technical–what’s really needed is better education so people can more easily defend themselves against misinformation. That’s not easy, of course, but libraries can obviously play an important role in the effort. 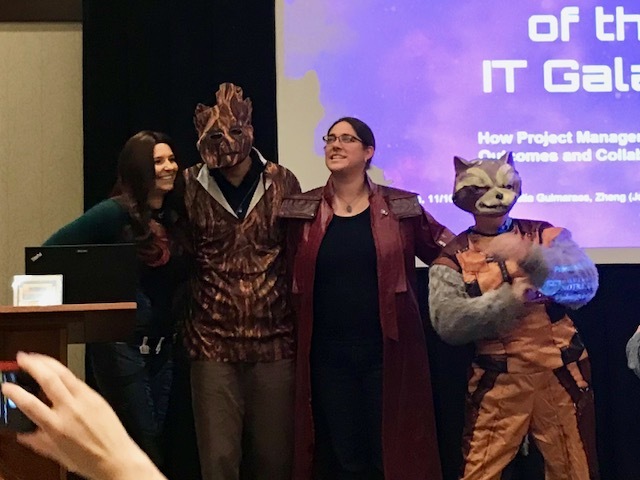 Project managers from Hesburgh Libraries, University of Notre Dame, presenting at LITA Forum, dressed as characters from Guardians of the Galaxy. Libraries also seem to be realizing that their traditional organizational structures might not be best suited to managing technology projects. Several presentations focused on Agile management methods, and how they can help libraries better coordinate developers, librarians, and infrastructure. One the best presentations in this regard was by a group from Hesburgh Libraries at the University of Notre Dame, who came dressed as characters from Guardians of the Galaxy. They talked about their libraries’ move to a project-based organization, and the establishment of an Office of Project Management helped lead to a more efficient, better documented, and more sustainable suite of projects. Thankfully the librarians from Notre Dame and others who talked about Agile methods took the Agile Principles as inspiration for a flexible set of practices, and avoided rigid adherence to the branded buzzwords of the full Agile playbook. Libraries may be slower than IT departments and commercial developers in adapting Agile methods, but it seems like they are also being careful in selecting the portions of the method that best fit with their culture.